Small 9-room traditional onsen ryokan on Kamiyamada Onsen's main street. 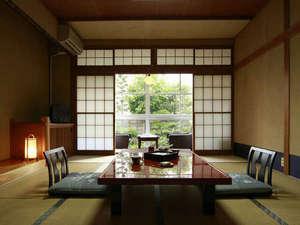 Aritaya's two-story wood building has over 100 years of charm. Friendly family-run establishment. 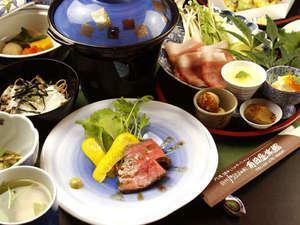 Many works of ceramic art from Arita are on display. From Togura Station(Shinano Railway), 7 min by bus (#9, "Kamiyamada Onsen Koen"　上山田温泉公園 stop). Free shuttle service available 14:30-17:30 -- just call upon arrival. To walk (2km, approx. 25min. ), proceed straight (west) from Togura Station 400m on Route 336 to 戸倉上山田中学校前 signal (middle school on northwest corner). Turn left and go south 300m to City Office Togura Branch signal. Turn right onto Route 55 and go west 600m crossing the Chikuma River to Sarashina Shrine light. Turn left onto Route 77 and continue south 800m as road curves and becomes Kamiyamada Onsen's Chuo-dori (main street). Aritaya Ryokan will be on your right.